Bettors should be able to calculate Double Chance and Draw No Bet odds and stakes when only Win-Draw-Win (or 1X2) markets are available. We provide an automatic Draw No Bet and Double Chance calculator tool and all the mathematical formula you would need to manually calculate odds and stakes for these markets. 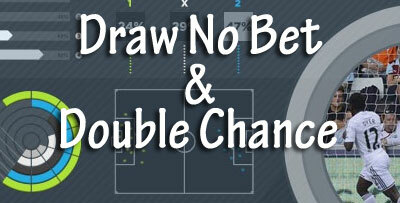 The Win-Draw-Win has a lower margin than the Draw No Bet and Double Chance markets. Just input the WIN-DRAW-WIN odds for a match, and specifiy the total amount you would like to bet. Then clik on calculate in order to see stakes and equivalent odds for double chance and draw no bet markets. As you can see, stakes depend only on odds for the draw. "Double Chance and Draw No Bet calculator for stakes and odds"